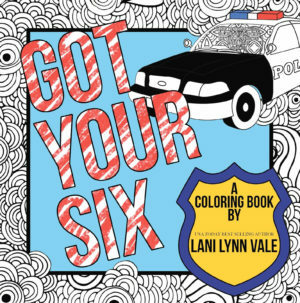 20 Fan-freakin’-tastic pages of adult coloring designs featuring quotes by USA TODAY Bestselling Author Lani Lynn Vale. Come on, pick up those Crayons, people! You know you want to!! A few months ago, I was made aware that the police officers from my hometown (Longview, TX) were in need of ballistic vests. They are over $700 per officer. The Back Our Blue association for my hometown’s mission is: To equip every officer at Longview Police Department with new body armor that is capable of stopping high powered rifle rounds. Though they’ve raised quite a bit of money so far, their goal hasn’t been met yet. That’s where I’m come in with the coloring books. All proceeds for each coloring book purchased will be donated to the Longview Police Department to help toward their goal. I would love for each of you to share, share, share. And if you could help this cause, even better. This has everything you’ll ever want in a coloring book, and to make it even sweeter? I’ve added the chapter headings on each page just to make your smile extra wide.